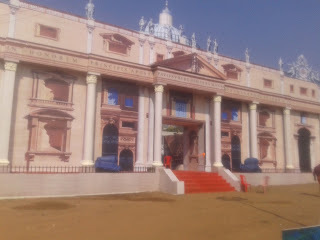 BUON NATALE exhibition has started at Saktan Thampuran Nagar,Thrissur.Public are allowed to enter the exhibition from 11.30 AM onwards and continue till evening.The exhibition will end on 10-01-2016. The exhibition is organised as part of Buon Natale 2015.HD Show,Aqua and Pet Show,Ice World,Photo Expo,Cake Cutting,Agri Fest,Dog Show,Food Fest etc are some of the highlights of the exhibition.However, some visitors have complained that,compared to the last Buon Natale exhibition, number of stalls are low.Expecting a huge crowd, organisers have prepared spacious parking ground in front of the exhibition venue.However, on Sundays parking is going to be a nightmare. Buon Natale (procession)will be held on 27.12.2015 (Sunday)at Thrissur.It is rumoured that it will be the biggest of its kind.Organizers said that 10000 santas and 2000 angels would participate in the event.Aditionally,20 flots will also be featured in the procession.BUON Natale procession will start from St.Thomas' College, Thrissur on Sunday at 5.00 P M.Below is entrance point of Buon Natale exhibition.